In several countries, there are barren deserts that could have been put to better use. As many places see migrating people andrefugees coming in, they feel the need for temporary settlements. The demand for refugee housing is also on a rise in many countries. In fact, some governments have also been looking for a permanentsolution to their increasing housing requirements. In such a scenario, using deserts to build something useful can be a great idea. One such idea has recently been submitted by Eric Randall Morris and Galo Canizares. Read on to know how it may help in infusing life into deserts. This design concept has been proposed for North Africa, which has been facing troubles similar to those mentioned above. 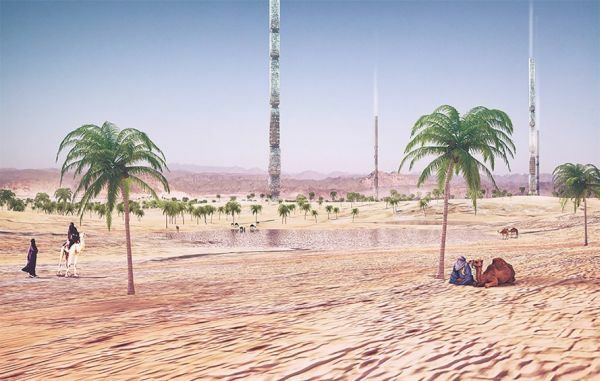 The Valley of the Giants aims at building skinny cylindrical skyscrapers in the midst of barren deserts so these full-of-life tall structures can provide all life-giving elements to these deserts. Such skyscrapers will be able to turn a desert into an oasis that offers life. Additionally, residents at such places will be able to live a greener, healthier life. This futuristic skyscraper concept may not only address the water scarcity issues at such places, but may also provide permanent shelters to immigrants to the country. This green concept is environmentally friendly, as well as a way to maintain cultural diversity. It can be a residing place for permanent residents and nomads too. The desert can accommodate tents, huts, and dwellings of different kinds for these residents. According to the Valley of the Giants design concept, the deserts will have long cylinders containing houseplant spores. The sustainable skyscrapers will also be able to produce, gather, and treat water to make it suitable for several uses. 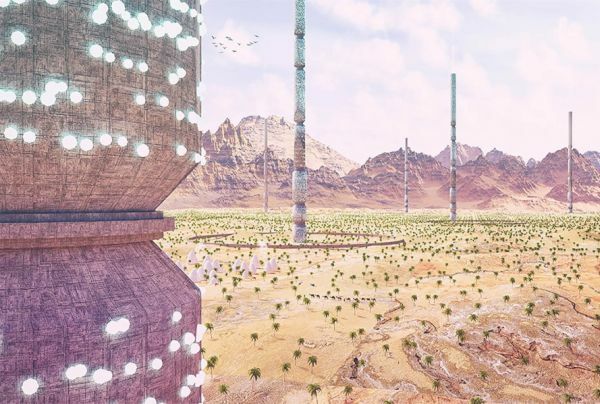 With such capabilities, these towers will be able to manage the pollination of landscape in deserts. In addition, the concept proposes to build a network of underground pipes. It will further help in developing wells and pools. Thus, a barren land can be turned into an oasis to support life and habitation. The Valley of the Giants is an innovative concept of developing cylindrical skyscrapers in deserts. As these structures will have elements of life, they will be able to create an oasis in a desert. Thus, it can solve housing solutions for North Africa in an eco-friendly manner.